Sports Center | Families for HoPE, Inc. It seems we have a sports theme going these days! First, congratulations to Laura Phillips for correctly naming the person in the “got HoPE?” contest. Laura is the mom to little Kaziah who has semi-lobar HPE. Laura will be receiving some logo items from Families for HoPE for her winning answer! The person in the photo is Luke Zeller, a graduate of Notre Dame, who is currently playing in the NBA Development League with the Austin Toros. If you’re a college basketball fan, you may have heard Luke’s name mentioned countless times last week as his brothers Tyler (Univ. of NC) and Cody (Indiana) were playing in the Sweet 16 of the NCAA Tournament. Luke is married to the girl next door–literally. Our next door neighbor’s daughter, Hope, married Luke in 2010. 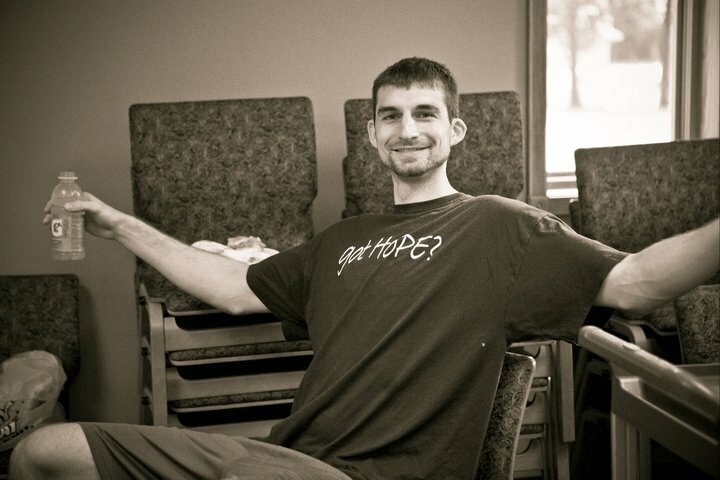 Just weeks prior to the wedding, Luke saw my husband, Steve, in the backyard wearing one of our “got HoPE?” t-shirts, and he inquired about it. The next thing I knew, Luke was wearing a “got HoPE” t-shirt too. It’s racing season again, and HPE awareness is being spread a lot this week. Kyle Gimple is racing this week in Birmingham, Alabama at Barber Motorsports Park, where he will be handing out Kyle Gimple Racing/Families for HoPE wristbands to the fans. Kyle’s team issued a press release this week, so be sure to check that out. Also, set your DVR for SPEED TV on April 8 at Noon, ET, to watch a replay of Kyle’s race. Last week, driver Josh Timmerman was interviewed for a podcast presentation on the syndicated radio show, Speed Talk. During the 20 minute recording, Josh shares the story of his involvement with Families for HoPE and how he uses his racing career to help raise awareness of HPE. Click HERE to learn more about who Josh is and what he stands for. If you get a chance, stop by the website for Speed Talk and check out the Families for HoPE logo. Speed Talk will be helping us with some fun awareness activities this summer!